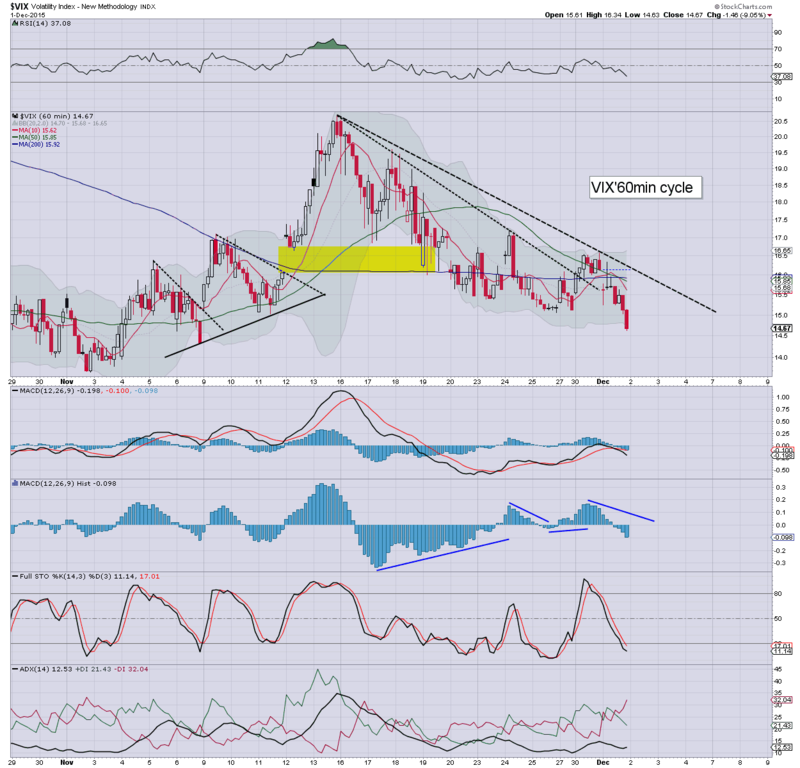 With equity indexes closing significantly higher, the VIX was naturally back in cooling mode, settling -9.0% @ 14.67. 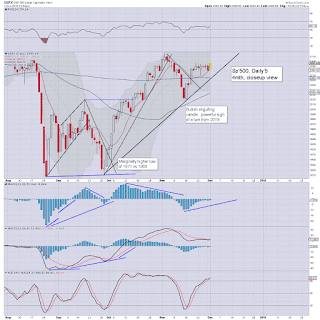 Near term outlook offers the sp'2115/20 zone, and that will likely equate to VIX 13/12s. If sp'2150/70 by mid Dec', a brief spike to the VIX 20 threshold is subsequently viable before year end. 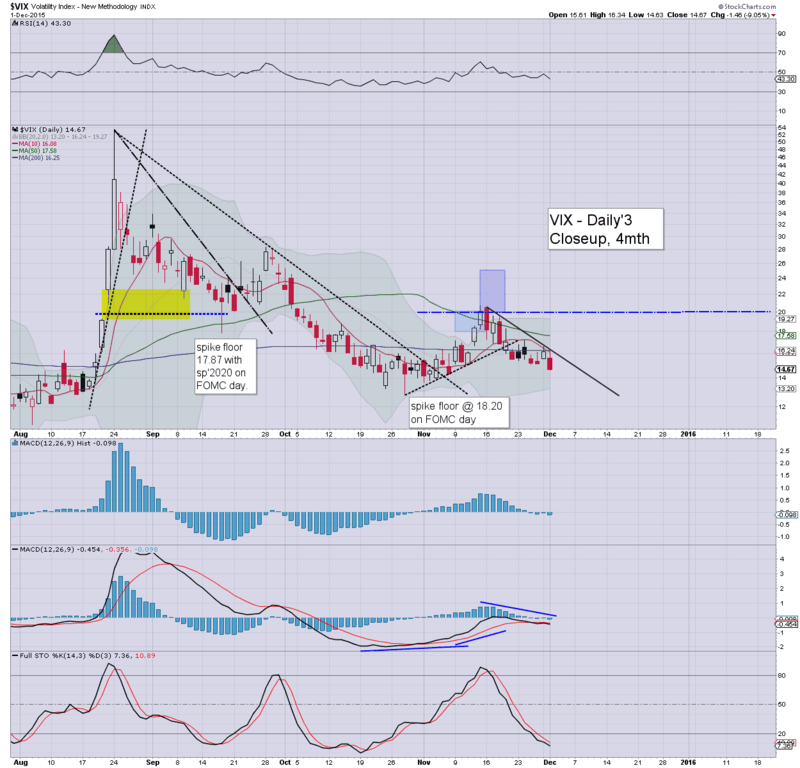 Suffice to note... VIX remains broadly very subdued. There is a scenario in that perhaps the market will reach 2150/70 at the time of the next FOMC, and then see a brief sell down. Broadly, equities look on track for continued strength into early 2016. 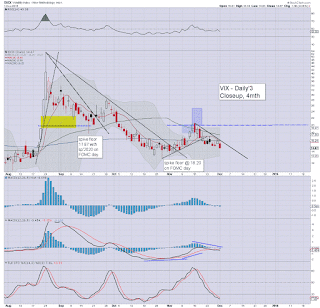 *As things are, I have ZERO interest in being long VIX until spring 2016.. at the earliest. 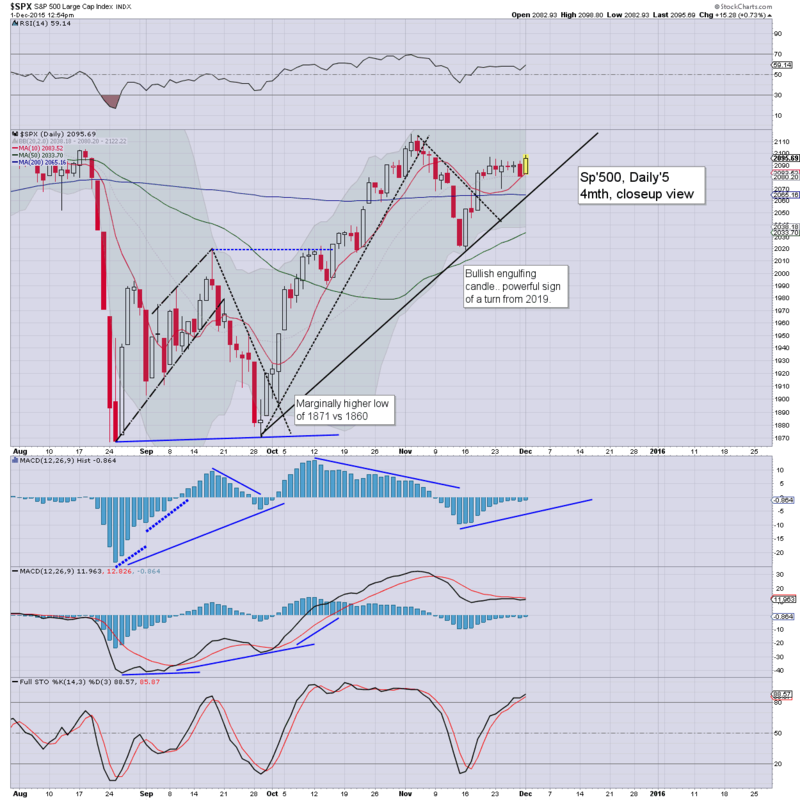 US equity indexes closed significantly higher, sp +22pts @ 2102. The two leaders - Trans/R2K, settled higher by 1.3% and 0.5% respectively. 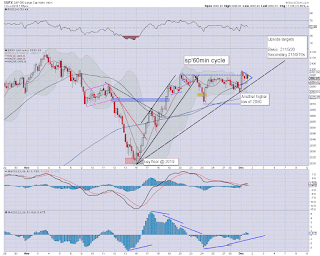 Near term outlook offers the sp'2115/20 zone, with a broader target of 2150/70 by year end. *closing hour action: renewed upside... with a clear short-stop cascade as the sp'2100 threshold was breached. So.. we've broken out of the trading range that lasted for a week. Now it seems just a matter of when we trade into the 2115/20 zone.. and whether the market gets stuck... or just keeps pushing higher. 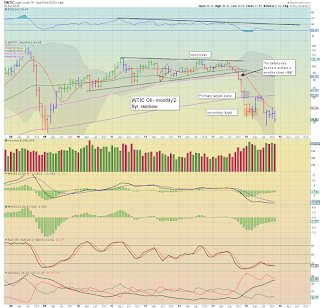 With price action/structure as it is, a straight run to 2150/70 by the FOMC of Dec'16th looks entirely possible. US equities are making yet another push for the sp'2100 threshold. Whether achieved into the close.. or early tomorrow.. from there, target is 2115/20 zone.... with a broader target of 2150/70 by year end. Oil continues to hold support (just)... +0.1%. A day for the equity bulls.. although yes... not as clear cut as the daily candles might suggest. 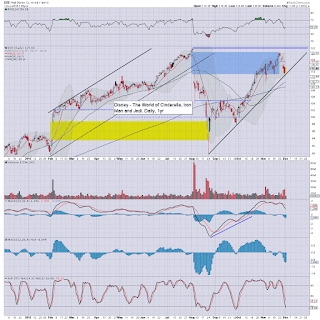 Broadly... we're still headed higher. *Riley is still gunning for the 2200s by year end...a bold target, but IS within range... assuming the Fed don't back off... again. 2pm update - baby bull flag? 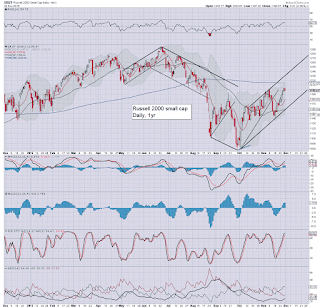 US equities remain somewhat stuck, with the sp' +11pts @ 2092. Price structure is a viable baby bull flag/pennant, offering renewed upside into the close/early Wednesday. For now, equity bears have nothing to tout unless a break <2080. Oil remains moderately choppy, back to u/c in the $41s. So.. price action is increasingly nano chop.. ahead of a fair amount of Wed' data/events. A daily close in the 2095/90 zone looks probable. 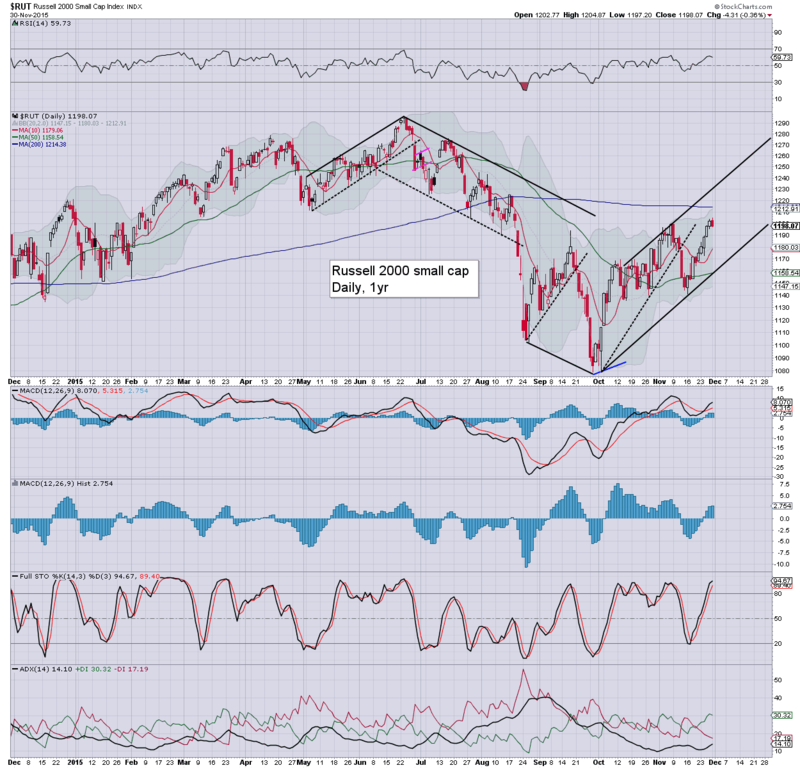 With another higher low of 2080, equity bulls remain in control. Today's candle is currently an inside day.. a viable turn... with the $117/118s viable by the Friday close. 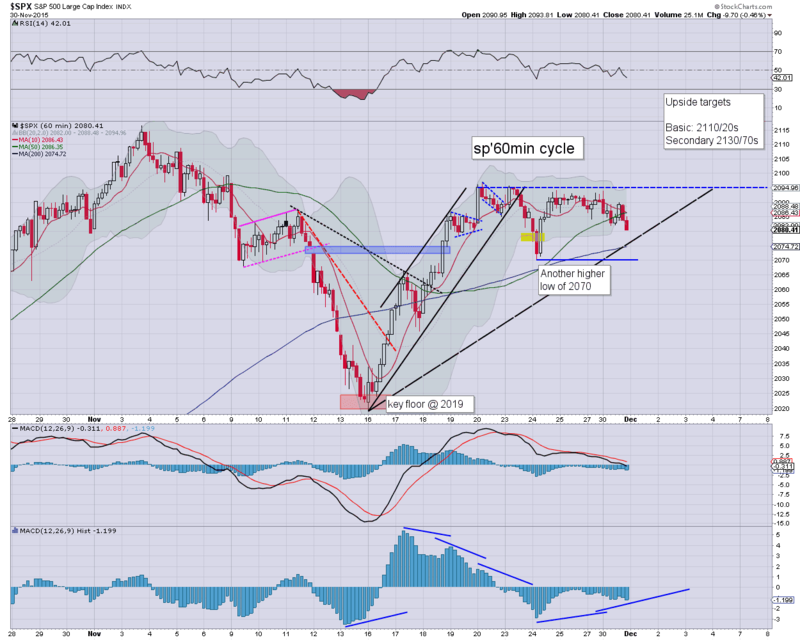 US equities are making another push for the sp'2100 threshold.. which remains due. First key upside is the 2115/20 zone this week, and then 2150/70 by end month. Metals are broadly flat. 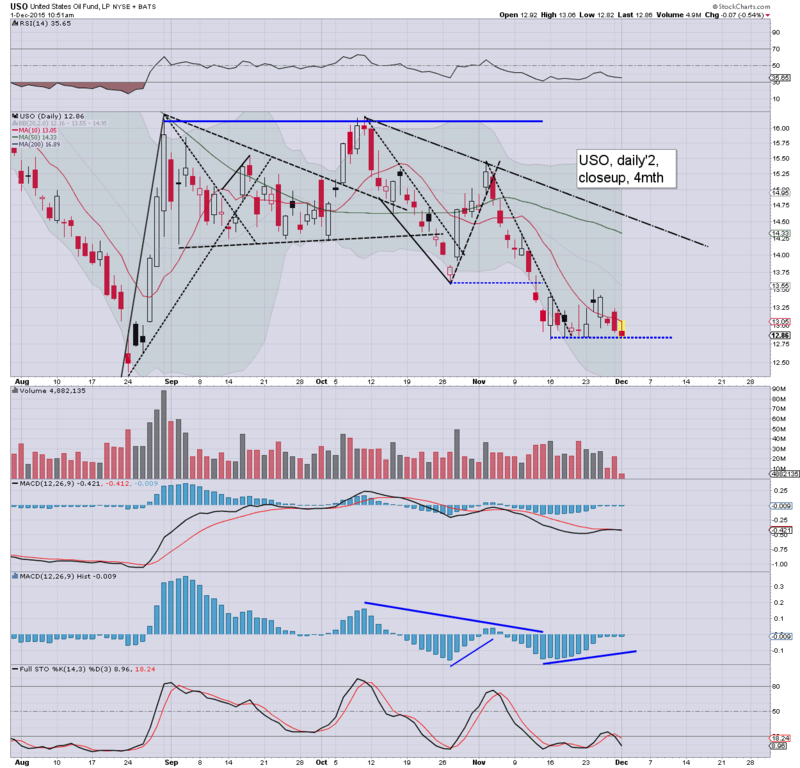 Oil is seeing churn on core support of the $41/40 zone. Hmm, not much to add. The real action begins tomorrow... lots of data... and a touch of Yellen. TSLA +2.7% @ 236... which is kinda surprising.. US equities are moderately higher, as the market continues to battle to break and hold above the sp'2100 threshold. Overall price action supports a move at least to the 2115/20 zone this week... with a broader upside target of 2150/70 before year end. 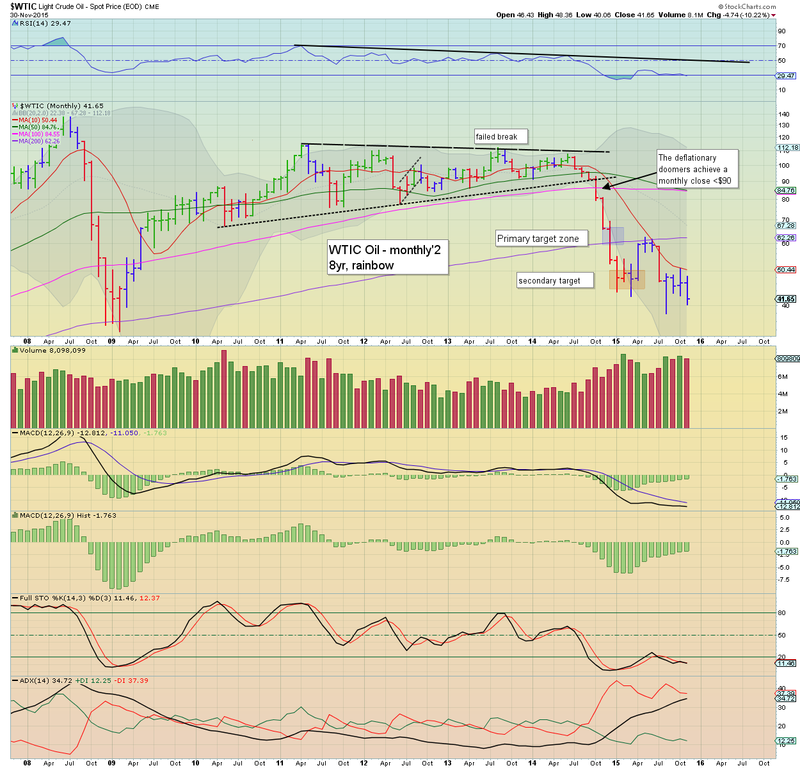 Oil is still struggling, but holding key support. Despite the rapid drop in the 10am hour... equity bears face a market that is clawing upward on any excuse. US equities saw a rather notable swing from sp'2098 to 2086 across just 25mins. 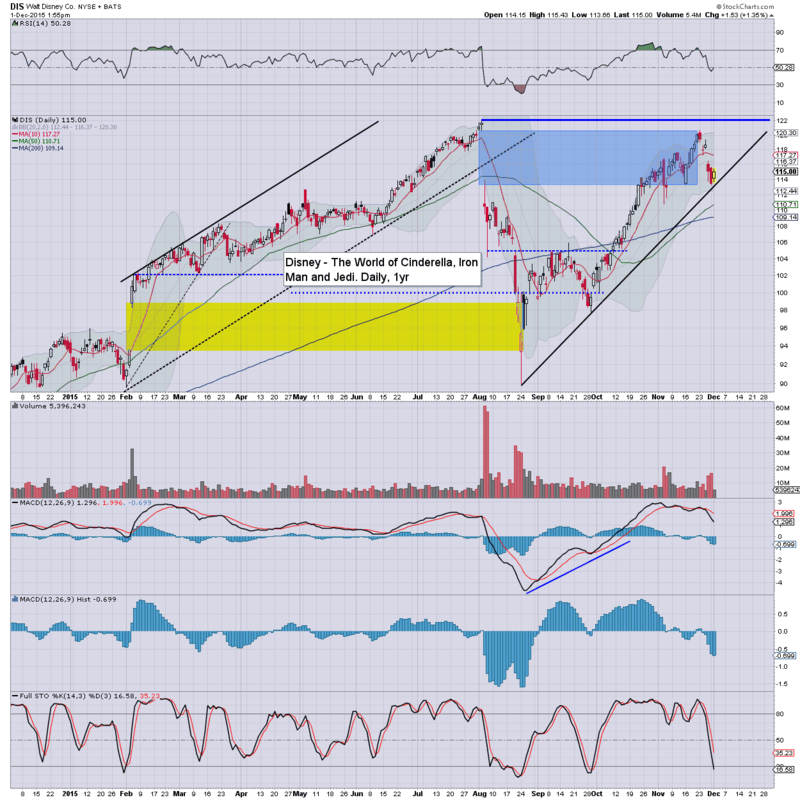 Yet.. the market has rebounded, and is making another play for the 2100 threshold.. which remains due. 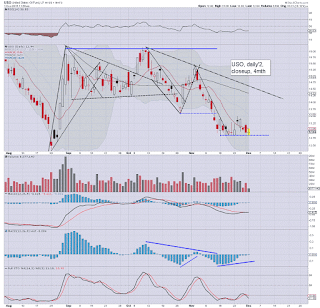 Oil continues to struggle, -0.5% in the $41s, sitting on key support. 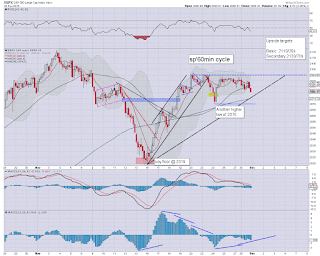 Certainly.. price action is pretty dynamic around the sp'2100 threshold... but on balance.. we still look headed higher. Oil remains on the edge... ahead of the next pair of Oil reports. A net draw down would likely be the excuse for renewed upside, but the bigger factor is arguably this Friday's bi-annual OPEC meeting. TWTR -1.2%... momo chasers refusing to get involved. 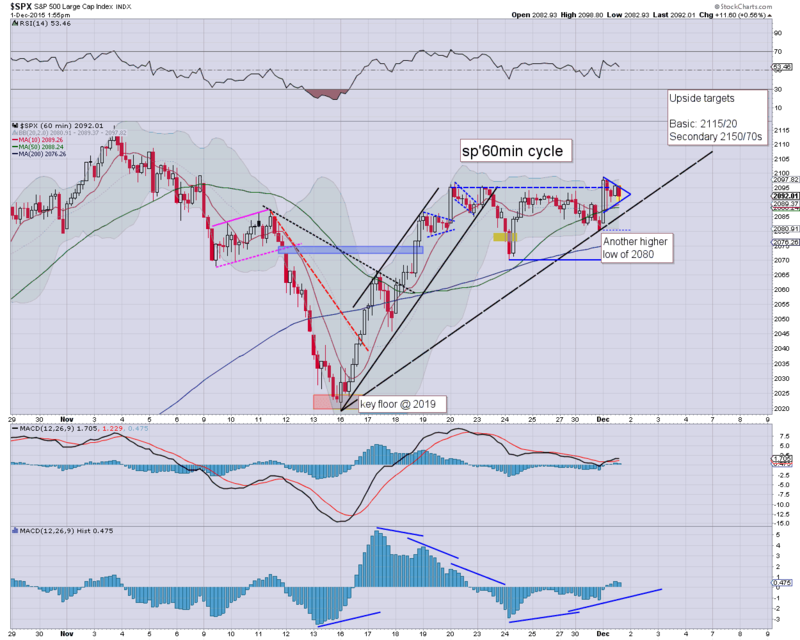 US equities open moderately higher, and are quickly building gains... as the sp'2100s are imminent. 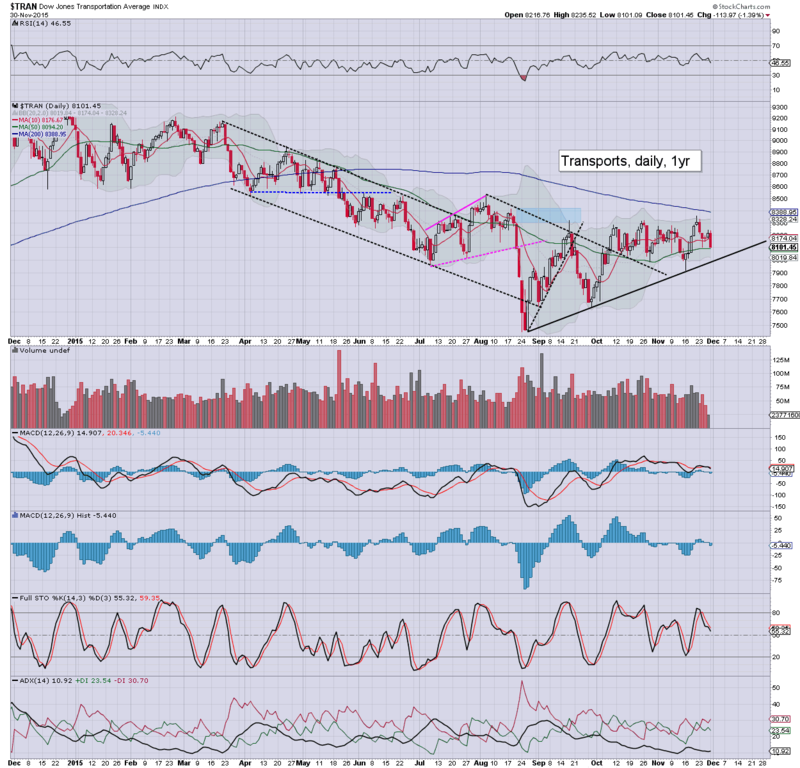 It is notable that Oil came close to losing key support.. but is now rebounding, first target is the 50dma in the $45s. 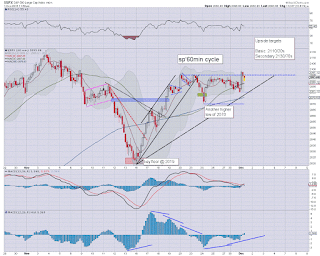 The hourly MACD equity cycle was warning of upside... and here we are... breaking out of the trading range. First target is the sp'2115/20 zone. Sustained action >2120 will offer a straight run to the 2150/70 zone, which remains viable by the FOMC of Dec 16th. notable strength: DIS +1.4% in the $115s. New historic highs >122... look viable, as the Star Wars hysteria is set to go exponential this month. Good morning. US equity futures are moderately higher, sp +7pts, we're set to open at 2087. 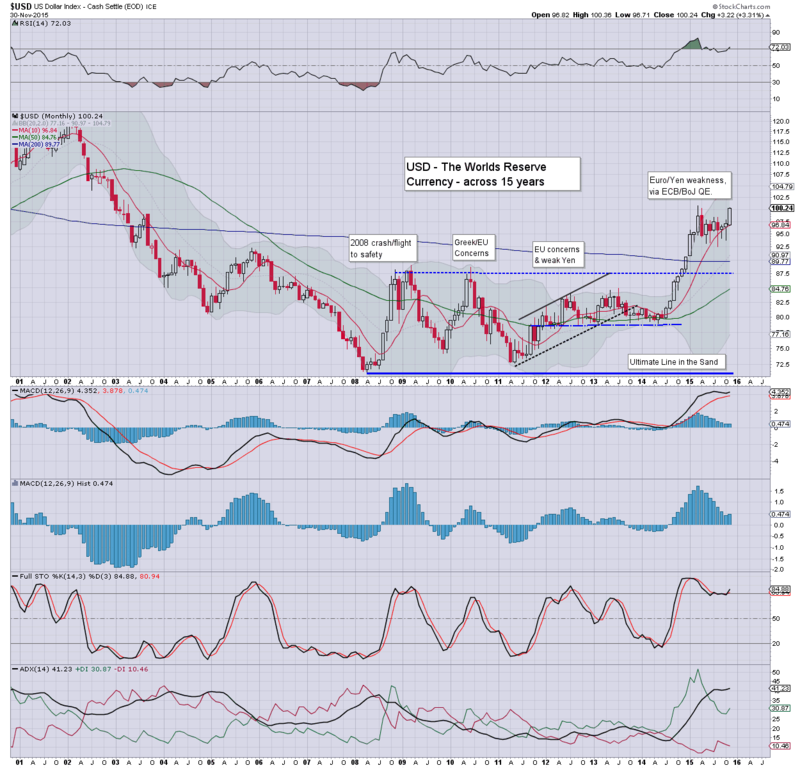 USD is cooling from the giant 100 threshold, -0.2% in the DXY 99.80s. Metals are bouncing, Gold +$6. Oil is a little twitchy... but currently u/c. Well, we made it to December 2015. A new month, and on balance, new historic highs in at least some indexes still appear due before this year wraps up. Japan: solid gains of 1.3%.. back above the 20K threshold. 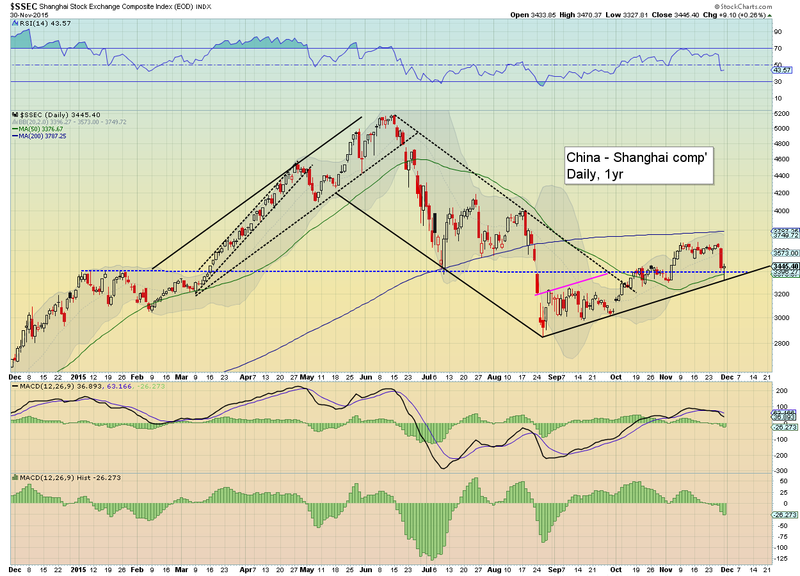 China: a lot of chop, but settling +0.3% @ 3456. 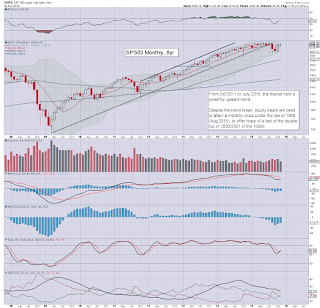 It was a mixed month for equities, with the sp'500 seeing a net monthly gain of 1pt (0.1%) @ 2080 (intra low 2019). 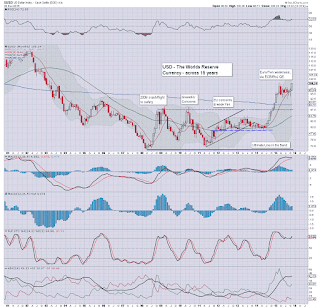 USD saw a strong monthly gain of 3.3%, settling above the DXY 100 threshold. 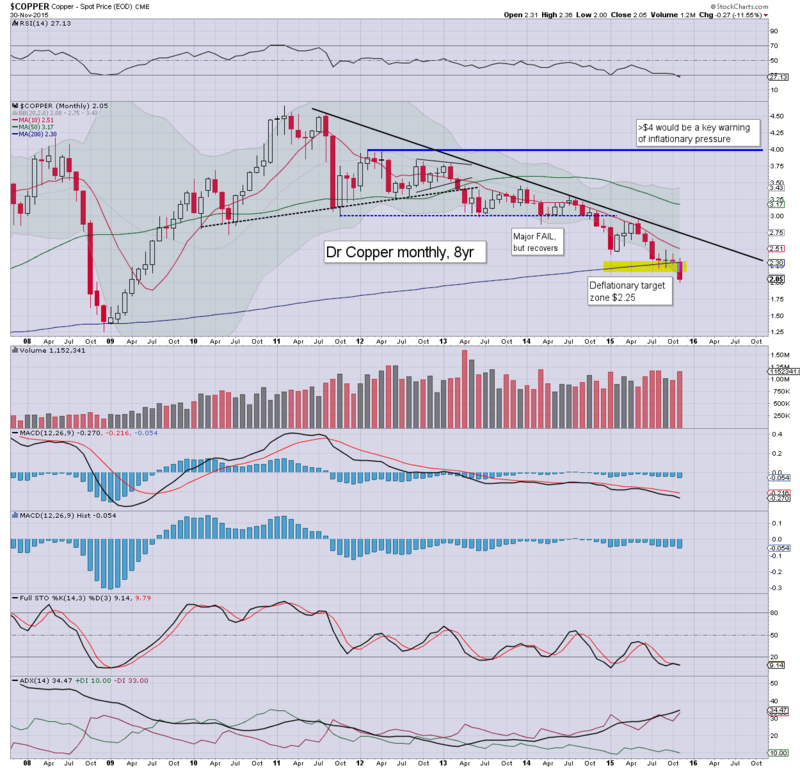 Commodities were under pressure, with Copper -11.5% @ $2.05, whilst WTIC Oil -10.2% @ $41.65. Equity bears failed to reverse the hyper gains of October. Indeed, we now have a key higher low of sp'2019. Until the market is trading back under the psy' level of sp'2K, the bears have nothing to tout. The USD has attained the first monthly close >DXY 100 since January 2003... almost 13 years ago. 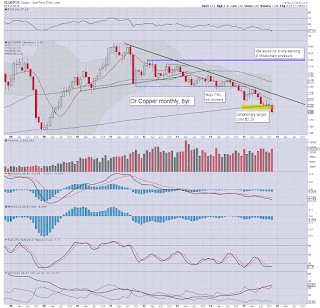 The higher USD is naturally putting downward pressure on most commodities, as reflected in the metals and Oil. The Monday net daily gain of 0.3% @ 3445, was a very fortunate late afternoon recovery for the equity bulls. No doubt the PBOC were meddling to hold key rising trend/support. Tuesday will see PMI/ISM manu', construction spending. US equity indexes closed moderately weak, sp -9pts @ 2080. The two leaders - Trans/R2K, settled lower by -1.4% and -0.4% respectively. Near term outlook remains broadly bullish, at least to the sp'2150/70 zone, which appears highly probable. 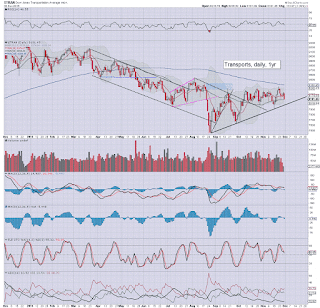 *the 'old leader' - Trans, continues to struggle, despite broadly weak energy/fuel prices. 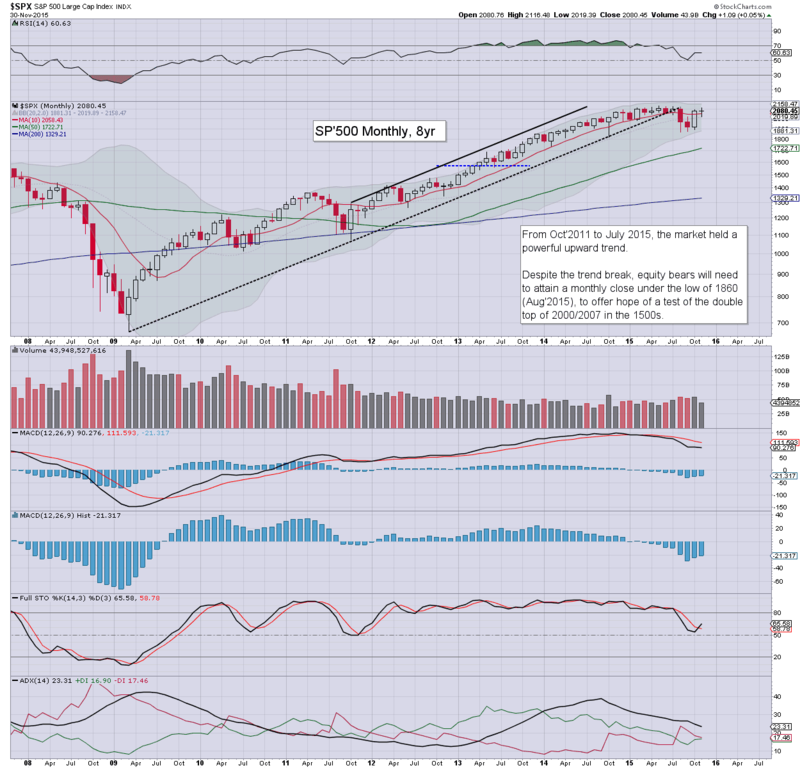 The sp'500 managed to just hold the 2080s, although 2070s are clearly now easily viable (if briefly) early Tuesday. Mr Market looks set to use the the ECB (Thursday) or the monthly jobs data (Friday) as the excuse for a challenge of the recent high of sp'2116. 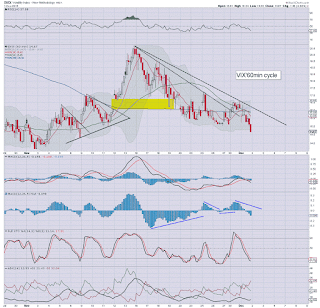 Any break >2120 will open the door to the 2150/70 zone.. before year end.